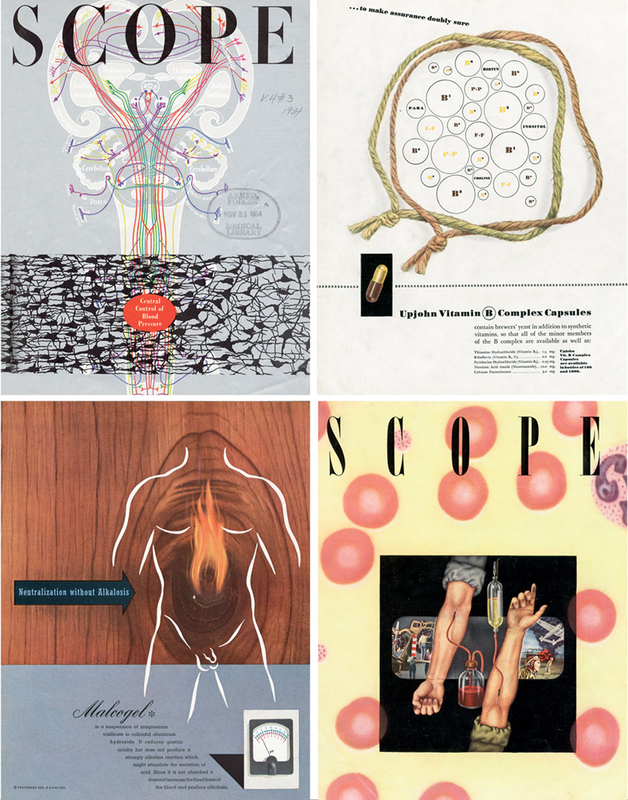 Targeted at doctors, pharmacists, and other health professionals, Scope was a monthly magazine published by Upjohn Pharmaceuticals between 1941 and 1957. Its mission was to explain the latest medical research, to report on advances in diagnoses and treatment, and to advertise Upjohn’s prescription drugs. Uniquely among specialized magazines of its time and type, Scope richly feature technical content, presented in innovative ways. Two pioneering American graphic designers were hired during different periods to create colorful covers, pages, and spreads with visual impact. 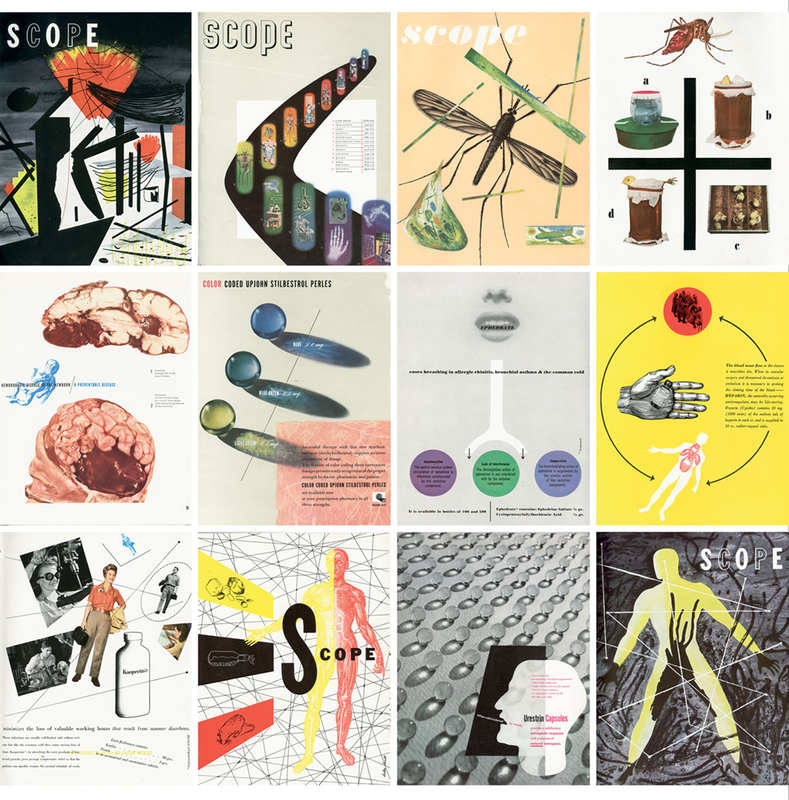 Scope‘s first issue was designed by Will Burtin (1908–82) in 1941. On a field of metallic silver, it featured a dramatic image of a baby behind a test tube. 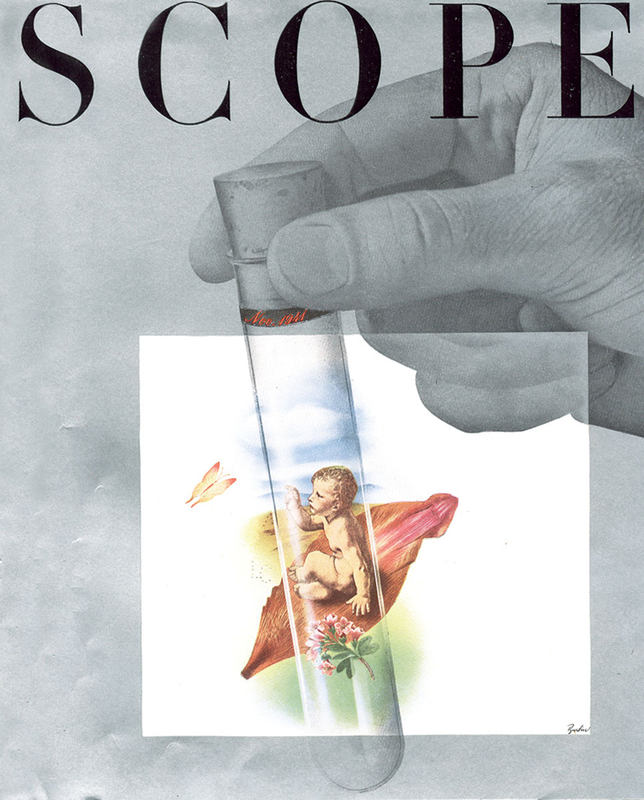 Symbolizing the progressive nature of Scope, the cover of this first issue imagined a “test tube baby,” some thirty-seven years before in vitro fertilization was invented. Clockwise from top left: Scope, vol. 4, no. 3, 1954 (Burtin); vol. 1, no. 3, 1943 (Burtin); vol. 1, no. 7, 1944 (Beall); vol. 1, no. 3, 1942 (Unknown). the company was so high that he was given permission to design a cover, spread, or advertisement and send the original graphics directly to the printer without having to get a final approval from Upjohn. This uniquely open process enabled Beall to experiment visually and stimulated his creativity. Beall looked back on his years of designing Scope as “very exciting from so many different angles: the design and layout, the typography and the opportunity of interpreting in terms of photographs, drawings or paintings.” His designs demonstrated what was possible when a brilliant designer was given freedom of expression. An aggressive self-promoter, Beall received accolades from the prestigious European design journal Graphis for many of his Scope pages. 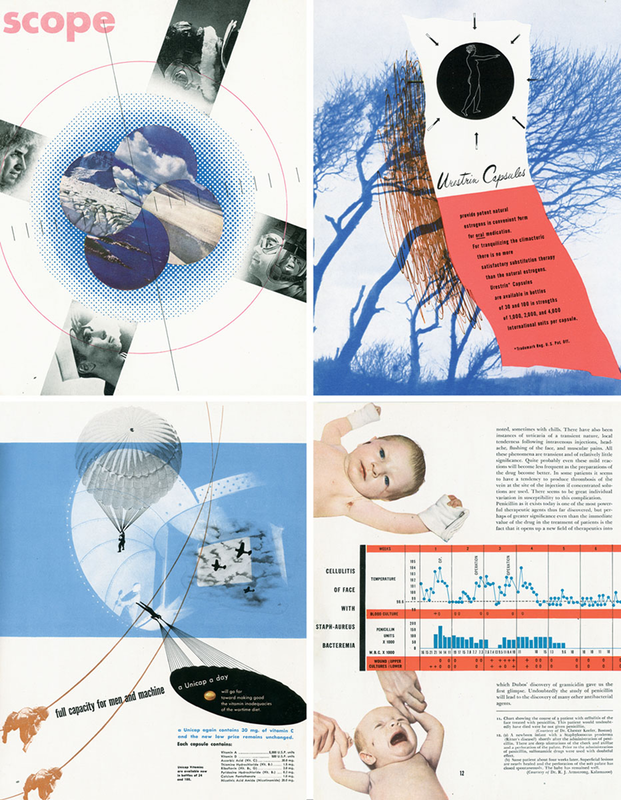 The work of Burtin and Beall at Scope helped to spark the development of a larger theory and method of “visual reasoning,” which sought to simplify complicated topics, banish complexity, and create in its place “a certain beauty of clear statement.” Scope set the highest standard for the effective and beautiful blending of form and content, which still inspires designers today. Top row, left to right: Scope, vol. 1, no. 8, 1944 (Beall); vol. 1, no. 2, 1942 (Beall); vol. 1, no. 7, 1944 (Beall); vol. 1, no. 7, 1944 (Beall). Center row, left to right: Scope, vol. 2, no. 2, 1942 (unknown); vol. 1, no. 2, 1942 (Beall);vol. 1, no. 7, 1944 (Beall); vol. 1, no. 6, 1944 (Beall). Bottom row, left to right: Scope, vol. 1, no. 7, 1944 (Beall); vol. 1, no. 6, 1944 (Beall); vol. 1, no. 5, 1943 (unknown); vol. 1, no. 10, 1945 (Beall). Above, quote inset: Clockwise from top left: Scope, vol. 1, no. 5, 1943 (unknown); vol. 1, no. 6, 1944 (unknown); vol. 1, no. 6, 1944 (unknown); vol. 1, no. 5, 1943 (unknown). Considering himself a teacher with interests in design studies, R. Roger Remington is Massimo and Lella Vignelli Distinguished Professor of Design at Rochester Institute of Technology, the first ever endowed professor in the design school. He has written several books stemming from his active engagement and research in the field of graphic design history. He is co-author of Design and Science: The Life and Work of Will Burtin, 2007.